Tim Beach holds The C.B. 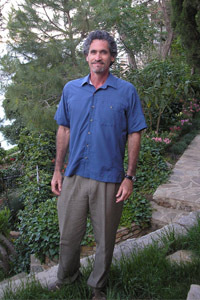 Smith, Sr. Centennial Chair in United States - Mexico Relations #2 and directs the Soils and Geoarchaeology Lab in Geography at the University of Texas at Austin. For twenty-one years, he taught at Georgetown University, where he held the Cinco Hermanos Chair and was Professor of Geography and Geoscience and Director of the STIA and Environmental Studies Programs. He has conducted field research on soils, geomorphology, paleoecology, wetlands, and geoarchaeology in the Corn Belt of the United States, Mexico, Belize, Guatemala, Nicaragua, Syria, Turkey, Iceland, Colombia, Italy, and Germany funded by the National Science Foundation, the National Geographic Society, USAID, The University of Texas at Austin, and Georgetown University. These field seasons have been the bases for more than one hundred peer-reviewed articles and chapters and hundreds of scientific presentations around the world. Most of his publications were on long-term environmental change, soils, paleoclimate, and geoarchaeology in the Maya world. He was elected as a Fellow of the American Association for the Advancement of Science and awarded Guggenheim and Dumbarton Oaks Fellowships, the G.K. Gilbert Award in Geomorphology, Georgetown University’s Distinguished Research Award in 2010, Georgetown's School of Foreign Service's Faculty of the Year for Teaching Excellence in 2014, and the Carl O Sauer Award in 2017. "What I stand for is what I stand on." Soil is our least understood but greatest natural resource and our most biodiverse ecosystem. Despite its importance, soil degradation is happening at high rates around the world, which leads to hundreds of billions of dollars of economic and ecosystem service losses. This course considers soils in the critical zone, including how they form, provide fertility to ecosystems and crops, how their ecosystems function, their distinguishing characteristics in Nature, their taxonomy, and their spatial variability around the globe. The course also considers how soils change both in negative and positive terms over time, such as carbon and other elemental fluxes, soil erosion, desertification, and soil pollution. The course then considers how we manage soils for a sustainable planet by sequestering carbon to counter climate change, treat soil and water pollution, conserve soil ecosystems, build soil fertility, and grow more crops with minimal environmental impacts. Specific topics will include biochar, terra preta, organic agriculture, the soil science in World Food Prizes (i.e., development), and agroecosystems. Three lecture hours a week for one semester. “In modesty and humility, be like the soil.” Rumi, c. 1250 C.E. This course will survey the causes of changes in climatic systems over both short and long time periods and their consequences for landscape dynamics, biogeography, land use, sustainability, and vulnerability. The first part of the course will introduce the study of climates from an earth systems approach. Implications of differences in climate for carbon, biodiversity, and humans will be discussed. The second part of the course will look at historical and current climate change trends and controls worldwide, including coverage of the different scientific methods used for studies of these processes. We will build towards developing the expertise to critically evaluate future climate scenarios using environmental and socio-ecological approaches. Students are expected to read the assigned readings and participate actively in class. The exams will test knowledge, vocabulary, and ability to explain and apply information. The class projects and writing assignment will work on the ability to synthesize and communicate on scientific issues associated with climate change. Assumes background from GRG 301C, GRG 301K, or an equivalent course. Long-term ecology as reconstructed from settlement and land-use histories. Empirical case studies in environmental history from the Mediterranean region, the Near East, and Mesoamerica. Applications to degradation, desertification, sustainability, and global change. Only one of the following may be counted: Anthropology 382N, Geography 356C, 382K. This interdisciplinary course addresses the principles and applications of Environmental History, directly linking contemporary issues of land degradation and ecological change to archaeological themes such as settlement and land-use histories. Geoarchaeology and related biological investigations allow empirical testing of popular hypotheses about the environmental impact of pastoralism and different agricultural systems, based on the principle that "historical monitoring" is essential to understanding processes and their consequences. Regional examples with different time-frames are critically examined from the Mediterranean Basin, the Near East, Mesoamerica, and Australia. These illustrate the potential of both archaeology and environmental history to re- evaluate neo-ecological assumptions about ecological transformation, degradation and sustainability. Honors course; restricted to students participating in an honors program. Soil is our least understood but greatest natural resource and our most biodiverse ecosystem. Despite its importance, soil is being degraded at high rates around the world, which leads to hundreds of billions of dollars of economic and ecosystem service losses. This course considers soils in the critical zone, including how they form, provide fertility to ecosystems and crops, how their ecosystems function, their distinguishing characteristics in Nature, their taxonomy, and their spatial variability around the globe with one-third of the examples from Latin America. The course also considers how soils change both in negative and positive terms over time, such as carbon and other elemental fluxes, soil erosion, desertification, and soil pollution. The course then considers how we manage soils for a sustainable planet by sequestering carbon to counter climate change, treat soil and water pollution, conserve soil ecosystems, build soil fertility, and grow more crops with minimal environmental impacts. Specific topics will include biochar, terra preta, organic agriculture, indigenous soil knowledge and farming systems, the soil science in World Food Prizes (i.e., development), and agroecosystems. Three lecture hours a week for one semester. The Seminar weaves climate and atmospheric science with long-term climate and historical and archaeological change. We will cover the essentials of the earth's radiation balance, precipitation patterns, and the orbital basis of patterns of long-term climate change; the large drivers of climatic flux, such as El Niño and the North Atlantic Oscillation; the long history of earthly climate before the time of humans, and some comparisons to Mars and Venus. We also explore the various methods (and their limitations) by which we try to understand climates of the past. The seminar will also take up the relationship of climate and humankind from human origins to the near future. Various scholars of human origins hypothesize that an important stimulus to the evolution of hominids was East African climate change millions of years ago. The emergence of larger areas of savanna habitat, for example, may have encouraged upright posture. The story of human migration out of Africa and around the world may also be connected to climate change, as (more reliably) is the story of migration across Beringia into the Americas. We consider the origins of agriculture and its relationship to climate change, and dozens of subsequent examples of human response to climate change, from droughts in the Maya and Mesopotamian worlds to the experience of the Greenland Norse during the Little Ice Age (c. 1300-1800). We will also offer ideas about human impact on climate, such as the hypothesis of William Ruddiman that early agriculture beginning as long as c. 8,000 years ago increased atmospheric carbon dioxide and forestalled an ice age. In closer detail we will examine the last few centuries and especially the modern rise of global temperatures since about 1850, and the dramatic rise since 1980. As the seminar approaches the present we will deal not only with impacts of and adaptations to climate change, but also the fractious international politics of the issue. The seminar will end with assessment of various scenarios for the future, and their potential impacts on humankind, economic prospects, and international politics. The seminar will have weekly lectures and discussions built around recent articles, climate classics, and the IPCC, and NRC NAS. Assessment for the seminar derives from several discussions and short discussion papers and a long paper of about 25 pages based on many sources from the peer-review literature. Ideally, the paper will be part of a thesis or dissertation or an article submission for a journal. We also plan a one day field trip for coring for the microfossil proxies of climate change. Prerequisite: Graduate standing; additional prerequisites vary with the topic and are given in the Course Schedule. Restricted enrollment; contact the department for permission to register for this class. Course number may be repeated for credit when the topics vary. Topic description: Aspects of soil geomorphology: soil formation, earth surface processes (erosion, sedimentation, and salinization) soil sustai nability, and landscape interactions in the Mediterranean, Mexico, and t he American Corn Belt. Will explore management and policy, soil interact ions in watersheds, and field and laboratory methods through readings, l abs, and field trips.